With Ezypay steering Temuka Transport Group’s payroll, the company is continuing to deliver industry-leading transport and logistics services, after 50 years in business. The Group is one of the largest transport and logistics companies of its kind in the South Island. It includes Temuka Transport, which provides paddock-to-port freight services; Barwoods, a transport company specialising in livestock transport; R&M Storage, a warehousing and logistics service; and Temuka Rail, which oversees the movements of rail containers in the Temuka district. Ezypay was recommended to Temuka Transport at the end of 2017 when the company’s accountant was no longer able to provide payroll services. Andrew Watts, Temuka Transport Group’s Information Systems Manager, says it was quickly obvious that Ezypay was the right choice. 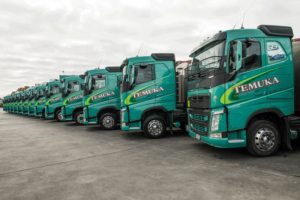 When Temuka Transport Group started working with Ezypay in January 2018, the first challenge was to migrate each of its four companies to a new payroll service without losing any important data. “It’s always a nerve-wrecking time changing from one system to another, not to mention when you are doing it for four different companies, so it was important that it was done right. Ezypay made the whole process as simple and stress-free as possible,” Andrew says. Top of mind for Temuka Transport was ensuring that the transition didn’t affect its 220 employees being paid correctly and on time. Ezypay also ensured that the new system was compatible with the systems used by each company to provide payroll information. Temuka Rail, Barwoods, and R&M Storage enter data from timesheets directly into the Ezypay web application, while Temuka Transport sends one large secure file with information from drivers’ log books. “We’ve quickly built up a strong working relationship with Ezypay. They’re always approachable and helpful if we have any questions. I would definitely recommend their services to any business,” Andrew says.